Day One of the Month Of Solitude begins with a sleety, cold Sunday. After seeing Mrs M off in a taxi I decided to grab a quick breakfast. I’m using MyFitnessPal, Up and Fitstar at the moment and they do throw up some surprising but interesting results. My standard breakfast at work and at home is yoghurt with granola and some fruit. Most of the calories come from the granola and generally I buy the variety pack of Dorset Cereals and then have half of one of the little boxes. They only have 85g in each but they pack a whopping 400 calories in return for good taste which isn’t too sweet. Up didn’t rate my selection; giving my breakfast a woeful 5.1/10 score. The verdict was that there is too much sugar and not enough fibre. – getting on for 40 minutes across country in drizzle and mud. My Up app linked to my Jawbone band tells me we did just over 2 miles and 4000 steps. I was cold and wet when I got home and by the time I’d dried off the dog and got warmed through it was time for a bit of lunch. 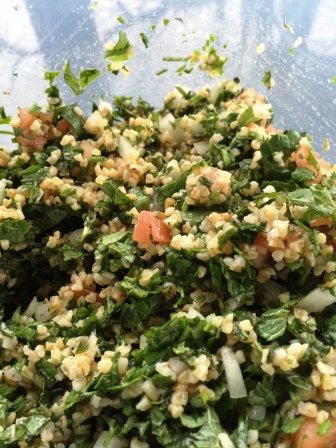 I absolutely love tabbouleh and I figured it was healthy too. It was not the perfect choice given the weather, when something more hearty would probably be better, but my mind was made up. 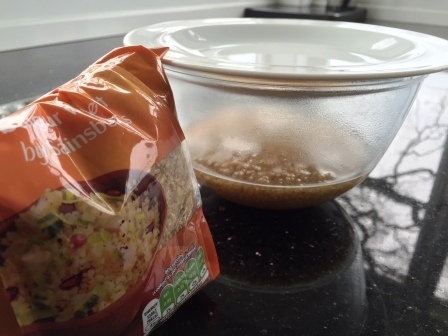 I started off with 125g of bulgar wheat in a bowl. I was planning to make at least two meals worth out of this. The quantity looked low but tabbouleh needs to be green, the bulgar wheat is not the main ingredient. I added 150ml of boiling water and let it just sit with a plate on top for about half an hour. Meanwhile I set about chopping mint and coriander. 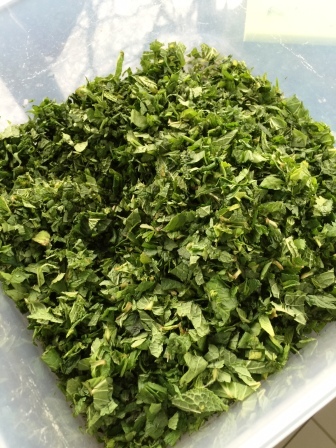 I think think the classic tabbouleh has parsley as the main herb but I am not too precious about it and I love a lot of mint. I don’t have either red onion or spring onion so took the regular onion I have and diced it small before soaking it in water to take some of the bite out of it. Pleasure number one was removing the plate on the bulgar wheat and smelling it. I’ve never really noticed this before but it has a wonderful porridge-like homely smell. I fluffed it up with a fork but it still has that nutty crunchy texture which is so good. I peeled and diced one good firm tomato, and chopped up a small garlic clove and then mixed everything together. I figured it was good to get the texture right before adding seasoning so I squeezed the juice of one lemon in and then add olive oil until it felt about right. A good turn of ground pepper and then sea salt until it tasted seasoned but still fresh tasting. After a chill in the fridge a served it with a breast of cold roast chicken (lucky dog getting the skin), a sprinkling of pomegranate seeds and a blob of one of my favourite easy, multi-purpose dips. I just mix a teaspoon of light mayo with a good tablespoon of 0% fat yoghurt, add a dash of lemon juice and a teaspoon of rose Harissa paste. It adds a little heat and moisture to the chicken. My presentation of the dish, when I set it in front of myself, deserved no more than 2/10 (and that was mainly for the colour) but the Up verdict was a near-perfect 9.5/10 and, with a glass of dry white wine, 697 calories is good going for a really tasty meal. 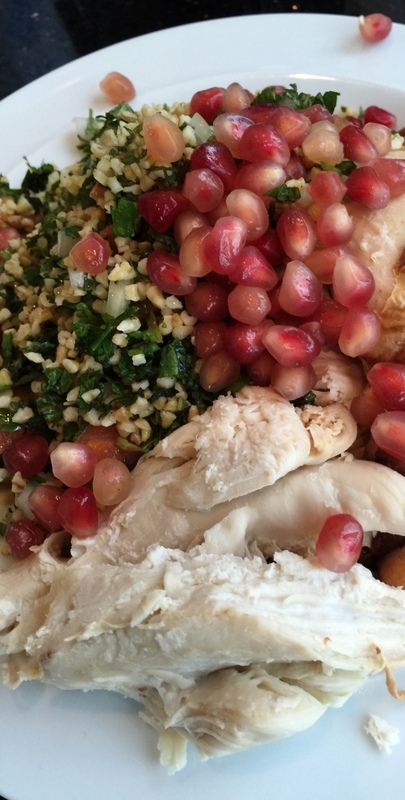 This entry was posted in Recipe and tagged coriander, Fitstar, harissa, Jawbone, lemon, mint, Moroccan, MyFitnessPal, pomegranate, tabbouleh, Up. Bookmark the permalink.